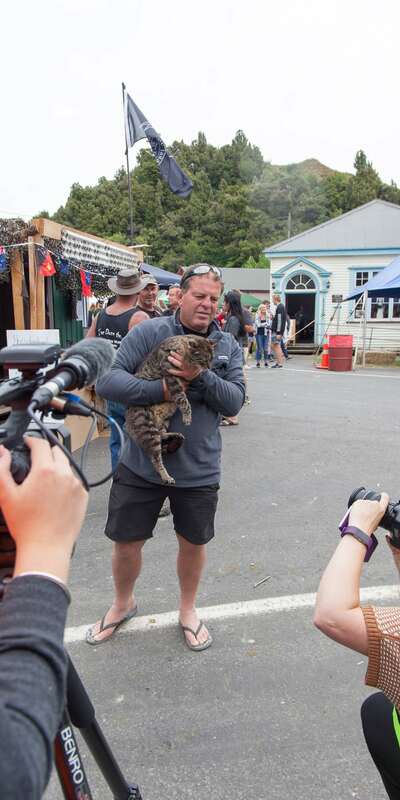 In what may have been the most bizarre sales pitch of my life, I rallied around the crew in the hostel to sell them the idea of going to vote for a cat in an Election in the self-proclaimed republic of Whangamomona. I didn’t know how to pronounce it, I didn’t know if the cat would win, but somehow, I convinced my new found friends the Whangamomona Republic Day was an event not to miss. Having based myself in New Plymouth for the first few weeks of my time living in New Zealand, I was quickly coming to realise there were a lot of weird and wacky things celebrated here in New Zealand. From the giant carrots and L&P bottles I’d passed on the highways, to the surprisingly great New Plymouth light festival where we had seen a fire dancer accidentally launch their flaming button into a row full of children in the days before, the squad were as equally down for embracing Aotearoa’s bizarre attractions. Now, I’m going to say Whangamamona Republic Day was a success, as a few of us have kept in touch and even met up since, in different countries and continents. Anna and I even headed off to road-trip Australia and the Bellarine Peninsula the next year. So, if you want an utterly jaw-droppingly strange way to bond with new found friends, and find yourself in Taranaki or the Manawatu-Wanganui Region regions of New Zealand every other January, then get yourself a passport to the Whangamomona Republic Day and experience this little slice of New Zealand where there isn’t even mobile phone reception. Wait, New Zealand has a republic inside it? This story dates back to 1989 when local councils decided to re-shape the country by changing the boundaries of regions. 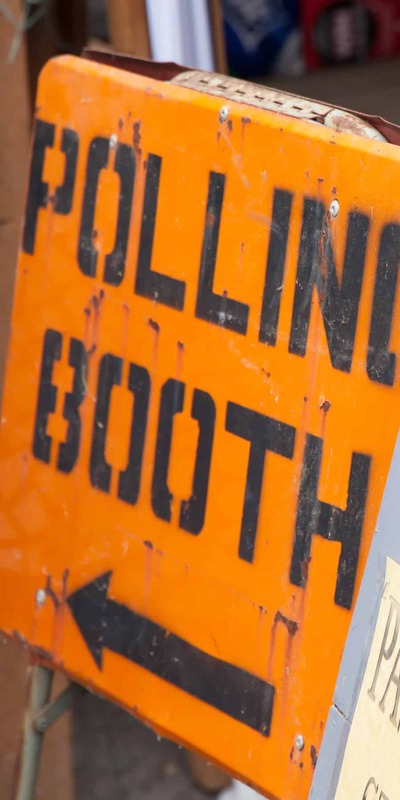 Whangamomona, which was in the Taranaki region, suddenly found themselves being shifted to the Manawatu-Wanganui Region on the plans and were less than impressed. 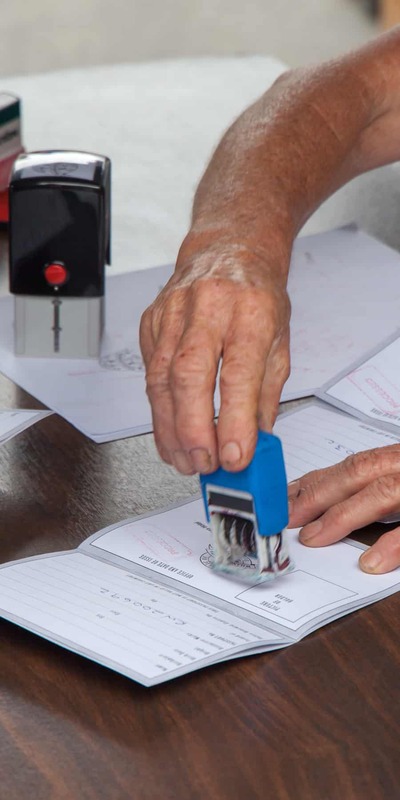 The community in Whangamomona wanted to stay part of Taranaki and on the 1st of November, they took matters into their own hands. Declaring themselves as a republic in a protest movement, the event was more protest than official, but the celebration has continued, and every other year the community has their republic day and it’s rather unique. 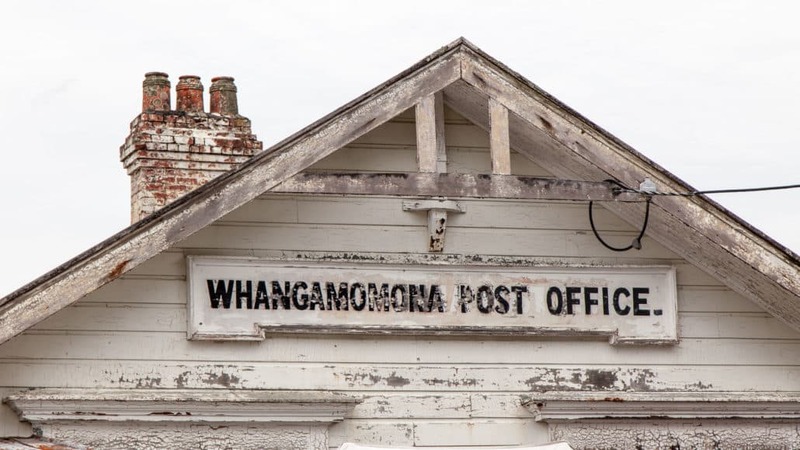 The 2019 Whangamomona Republic Day is extra special as this year, The Republic of Whangamomona is celebrating its 30th anniversary! What and when is Whangamomona Republic Day? The Whangamomona Republic Day happens every two years in January and is a celebration of independence and the voting of the president. 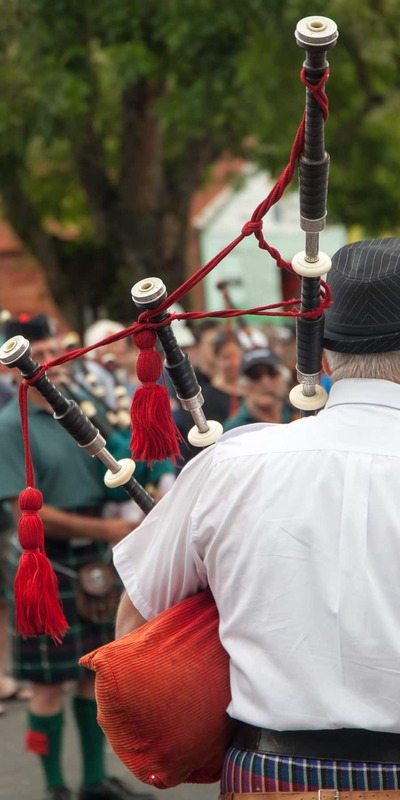 The next Whangamamona Republic Day in 2019 falls on Saturday 19th January and runs between 10am-4pm. The date of the 2021 Whangamomona Republic Day is yet to be confirmed but will be around mid-month as per usual. Do you need a ticket for Whangamomona Republic Day? Kind of! 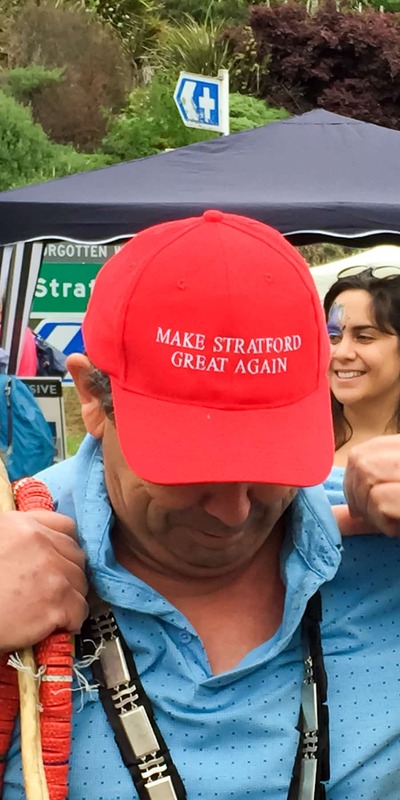 If you are going to be using the buses from Stratford, then you’ll need to book and pay for these in advance via the tourism board. If not, you’ll still need to buy a ‘passport’ to enter the Whangamomona Republic, and these cost $5. I think it’s fair to say these aren’t official travel documents, but you can get your passport stamped once you arrive at the republic. Oh yeah, and all fundraising and ticket sales from the event go to help local causes, such as health groups, schools and supporting youth clubs and events in the village. Win-win. So, what happens when you get to Whangamomona Republic Day? My morning started in the city of Stratford, Taranaki, where multiple buses were shuttling us new passport owners down to the Whangamomona Republic. The merry crew from the hostel had opted to drive, but I was signed up for the fully fledged experience. Winding down the Forgotten World Highway of Taranaki, the landscapes shifted to rolling green hills and almost jungle-like vistas, the landscape was different here, and we were tracing history. 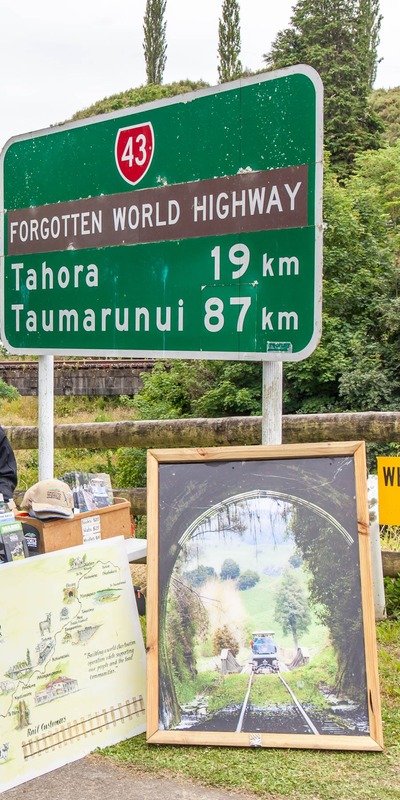 The Forgotten World Highway is quite an exciting drive, linking one of New Zealand’s least touristy regions, Taranaki, back to the main highway. 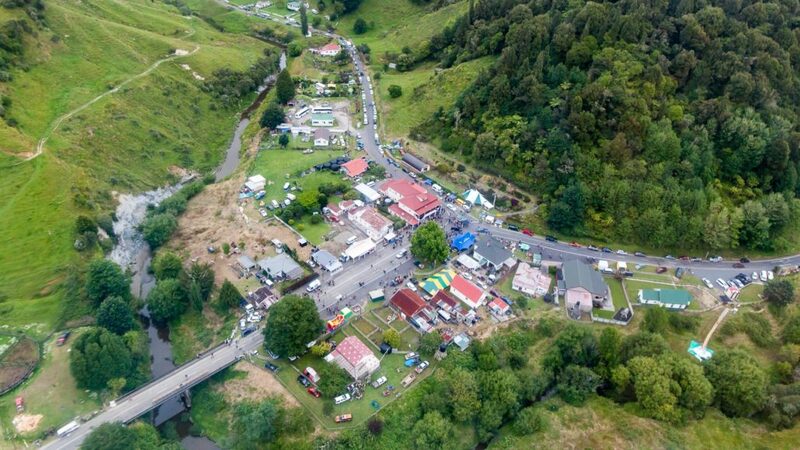 Whangamomona is tiny, the population of which wouldn’t even fill a flight, but on Whangamomona Republic Day the roads are closed, and the streets are packed with events: some fun, some strange, and some just, well, kinda… concerning?! The second we arrived, we felt like we had stepped back in time. If New Zealand had a Wild Wild West, on first glances, this could be mistaken for it. 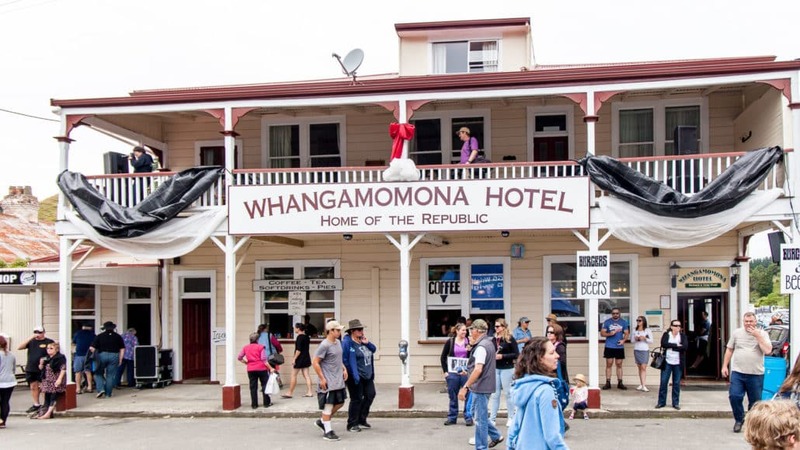 The friendly locals were smiling, laughing, and sinking cold ones in the Whangamomona Hotel, the central meeting spot and the Republics pub and accommodation. The community feel to the event is strong here, and you can tell how happy and proud the locals are to share Whangamomona with visitors, especially given the crowds sometimes hit above 1000 on the Whangamomona Republic Day! Food stalls supplement the Whangamomona Hotel so you can chow down on some tasty local treats, think Pies, Lemmingtons and all your other New Zealand favourites. Performances are put on throughout the day by bands and dancers, and special guests are often in attendee including a top rugby team the year I was there. 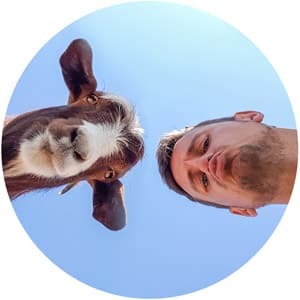 More bizarre events, which some animal lovers may find questionable, include the sheep shearing competition, possum skinning (possum skin is used a lot in New Zealand in a similar way to leather) and the amazing sheep race. You can place guess how many eels are in the bathtub, or perhaps be daring and swim through it. It’s certainly worth noting all eels make their way back to the river at the end of the day and none of the animals are harmed for entertainment. It’s essentially a good old fashioned Kiwi day out, and we all certainly had plenty of laughs and memories to take away. Local businesses are also around selling their goods, and if you want to venture out and explore the area, there are possibilities. 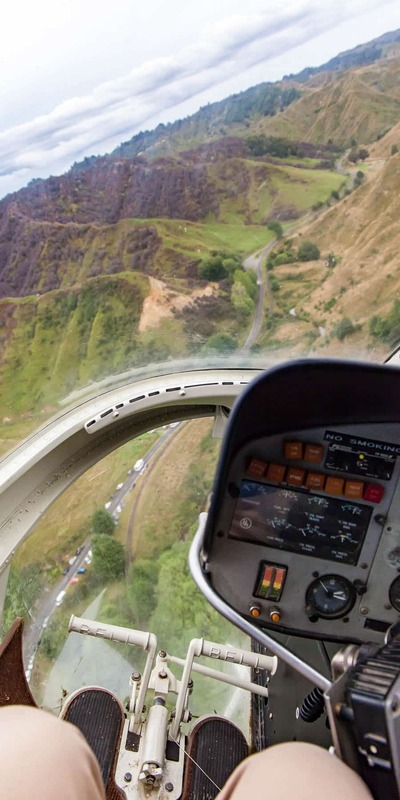 Scenic helicopter flights over Whangamomona and the forgotten highway were running when I attended Whangamamona Republic Day and at only $50 per person for the flight, they were by far the cheapest I had seen in New Zealand. The old train tracks here also now play host to little carts and peddle bikes, so you can venture off to see a slice of New Zealand history when you slip away from the crowds. The main event of Whangamomona Republic Day is for sure the presidential elections where anyone, or rather anything, can stand. We all opted to put our ballot down for the pub cat, who mysteriously went missing just before the votes were count and foul play was expected. 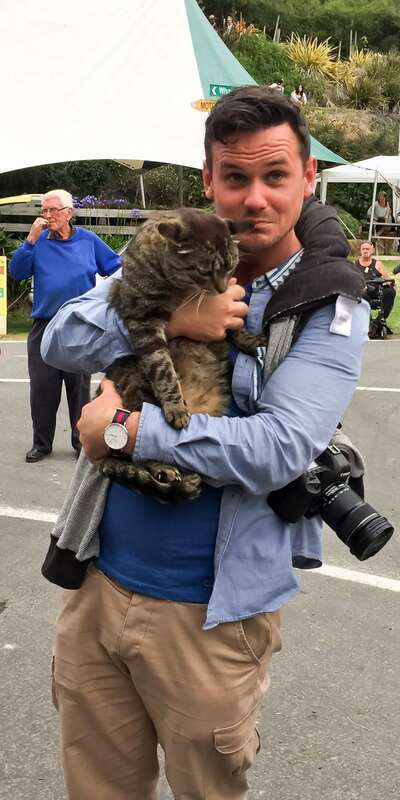 Luckily, the cat turned up, and I got to hold him just before the national news interviewed the cat for New Zealand TV and websites… yup, told you it was somewhat bizarre though after living in New Zealand for a bit, I can tell you I’ve seen stranger stories published on slow news days. Sadly, the cat wasn’t the winner in 2017, and a human came out ruling supreme. But in the past four-legged friends have been the president, including Billy Gumboot the Goat and Tai the Poodle…. according to my local news research, the poodle had an assassination attempt. I think that’s about all I’ve got to say on Whangamomona Republic Day, in what might be the most bizarre article I’ve ever written! But, if you find yourself in the area, especially on Whangamomona Republic Day, do swing by for something you really won’t forget. While the rest of the year the Whangamomona Republic returns to a more calm state with far fewer visitors, this is a rarely visited side of the country and a true New Zealand hidden gem. Know any other crazy cat elections or similar stories in the world? Let me know in the comments; I’m keen to continue my wacky tour of the world’s events! Loved your slant on Republic day they are an awesome hardworking kiwi bunch I have assisted a few times as my daughter was in the team and we kinda got roped in to help this included getting up early traveling to Hamilton in old fashioned clothing (which got extremely hot) selling passports sheep race tickets and a souvenir newspaper to all aboard the very long train heading to Whangamomona it was some trip but well enjoyed by all. 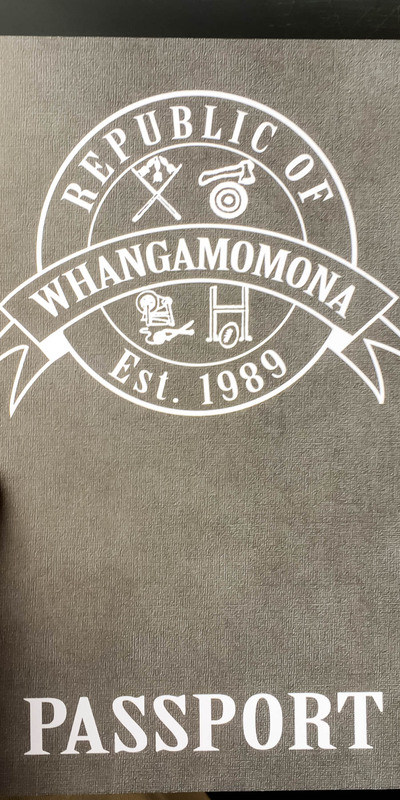 Haha I’ve never heard of Whangamomona before – what a name!